Yesssss…. This Chocolate Covered Strawberry Cake from scratch is every bit as delicious as it sounds (and looks)! 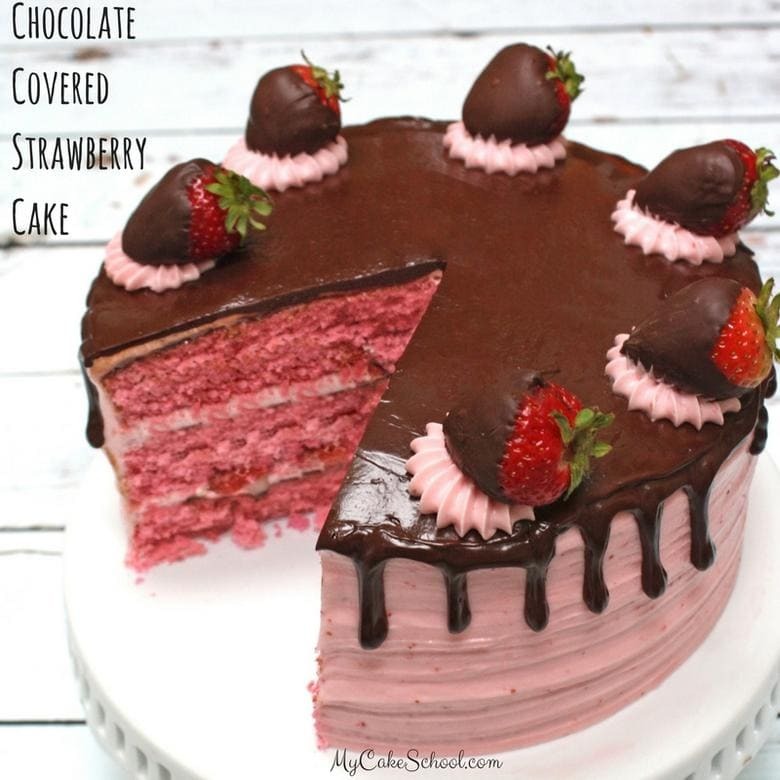 This flavorful homemade strawberry cake recipe is one of our most popular, and with the addition of chocolate ganache and fresh strawberry slices, we have a new favorite way to enjoy strawberry cake! I love to decorate desserts with simple, freshly dipped chocolate covered strawberries. Not only do they add instant elegance, but the taste is perfection! This cake brings that winning combination of chocolate and strawberries to a whole new level. 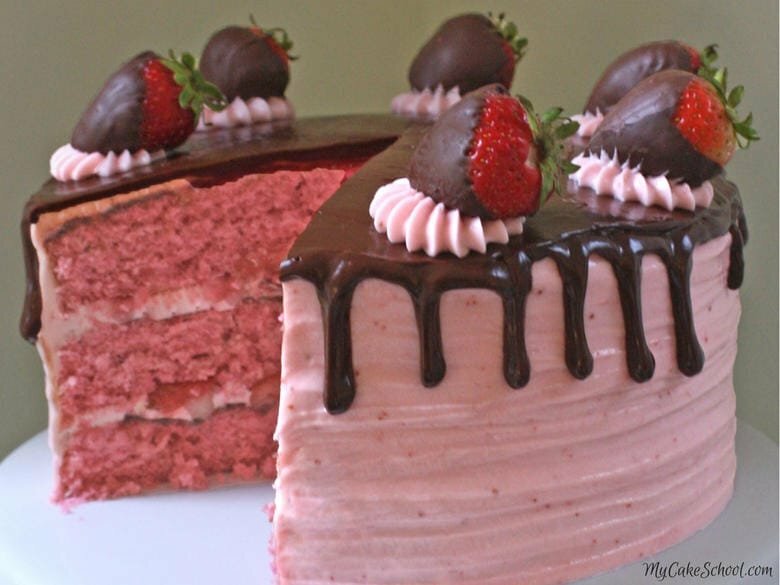 Strawberry is the leading flavor in this cake recipe. We have strawberry cake layers, strawberry slices in the filling, and strawberry buttercream filling and frosting. Since the ganache is so rich and decadent, a little bit goes a long way. 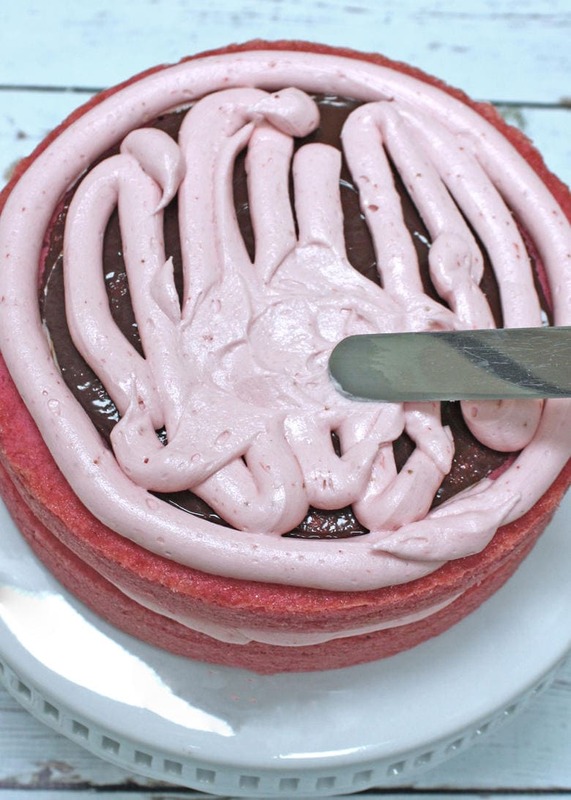 We decided to use just a thin layer in the filling, and a drizzle over the top to achieve the strawberry and chocolate deliciousness we were hoping for! 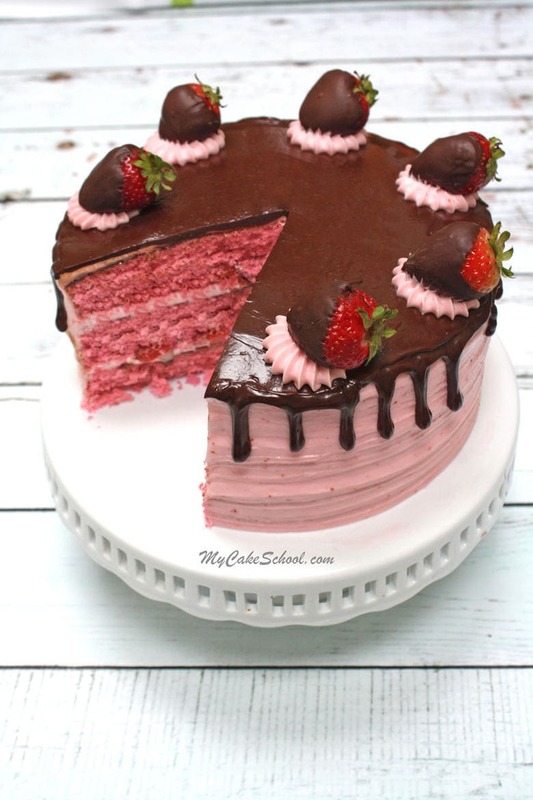 We actually experimented first with frosting and filling our strawberry cake with ganache and chocolate buttercream instead, but the strawberry flavor seemed to disappear in a sea of chocolate. For this recipe, we used the conventional method of mixing for our scratch Strawberry Cake. The flavor and texture are just as amazing as when we use the reverse creaming method of mixing (as in our other Strawberry Cake post.). If you prefer the reverse creaming method of mixing, that version of our Strawberry Cake would be perfect for this cake also! We just wanted to have a conventional option for Strawberry Cake since we’ve had some requests for this! *As with most cake recipes that call for the conventional method of mixing, the resulting cake layers are nice and fluffy! For this reason, we recommend this version when making strawberry cupcakes. SO good! For our ganache drizzle and filling, we used a 1:1 ratio of chocolate to cream. This is a great consistency for drips and thin glazes, as we explain in our Easy Ganache Drip post. We’ve used this simple, microwaveable ganache recipe for several of our cakes now, including Oreo Cake and Mint Chocolate Chip! 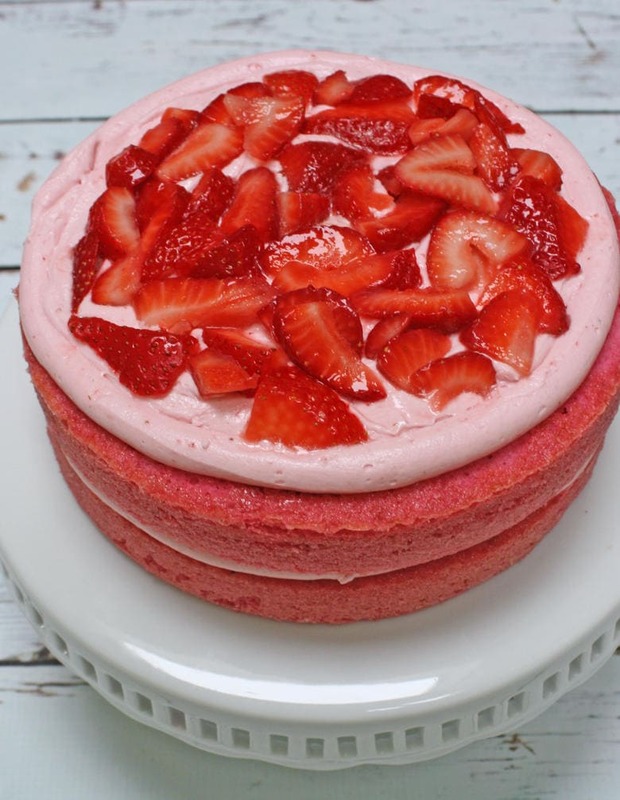 For this Strawberry Cake recipe, I baked three 8 inch cake layers. While assembling the cake, I glazed each interior layer with a thin layer of ganache, followed by a layer of strawberry buttercream. I also snipped the tip off of a disposable piping bag filled with strawberry buttercream to create a dam. I did not take my dam all the way to the edge. The dam is optional, but I was worried that juices from the sliced strawberries would escape. 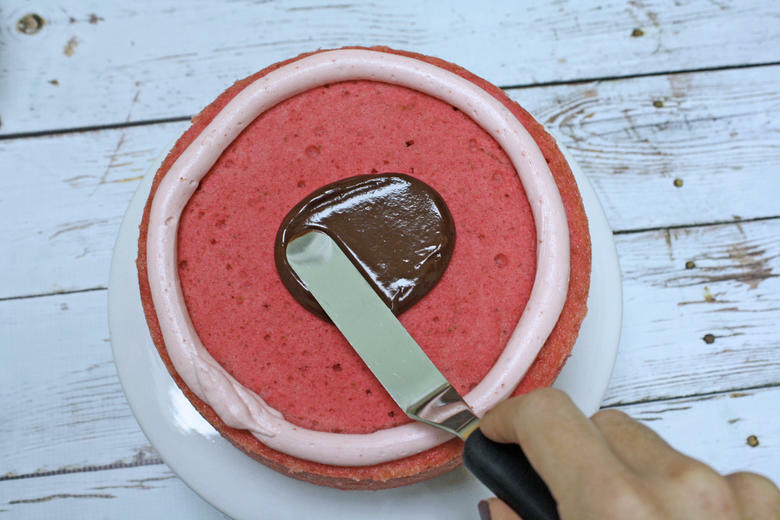 After spreading a thin layer of ganache, I piped additional strawberry buttercream on top, and gently smoothed over it with my spatula. Next, strawberry slices! I arranged thinly sliced strawberries on top of the strawberry buttercream. This gives us an additional strawberry flavor boost! After adding the third cake layer, I frosted my tier with strawberry buttercream, smoothed the sides with a bench scraper, and then used a thin tapered spatula to add ridges. The easiest way to not only frost a cake but also to add ridges like this is to place the cake on a turntable and so you can spin your tier as your work. I used very little pressure when adding ridges so that it wouldn’t disrupt the flow of our ganache drizzle. Then, I applied ganache over the top of the cake, carefully spreading until it met up with the drip around the edges. Doing the ganache drip this way allows you to have a very uniform drip all the way around, which I love! 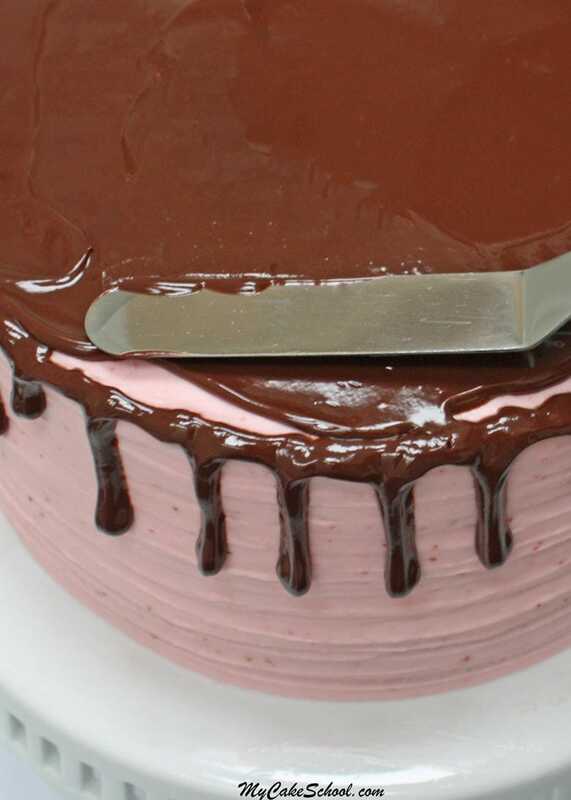 However, if you’d prefer a less uniform look with wider drips of chocolate ganache, you could add ganache to the top of the cake and let it spill over the sides here and there as you spread it with a spatula. Just keep in mind that the more ganache you push over the edge, the further it will drip! Before applying your drip around the sides of the cake, do a little test run on the inner edge of your bowl. If the ganache quickly flows all the way down, it is too hot. You’ll want to let it cool off for several minutes, checking often. The ganache will just be barely warm when it is ready..and it will thicken as it sits. If the ganache drip is too thick to drip, you can heat it up very briefly– a few seconds at a time- until it reaches the desired consistency. I always like to pipe my chocolate drips on a chilled cake. This slows the drip down a bit as you pipe! I finished things off our cake by piping stars of strawberry buttercream around the top edge of the cake with an Ateco 863, and topped with chocolate covered strawberries!! Loving the drama of not only the drip but the chocolate covered strawberries as well! We hope that you enjoy this recipe as much as we have! 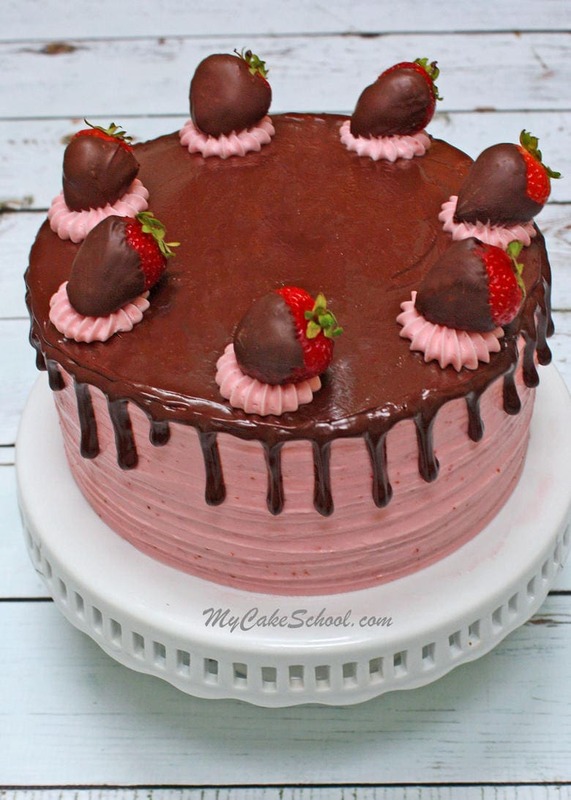 This moist and delicious homemade Chocolate Covered Strawberry Cake recipe is a crowd pleaser! 3 cups (342g) cake flour **If you do not have cake flour see note below. *If using all purpose flour (plain in UK) you can use the following substitution: each cup of flour in the recipe, remove 2 Tablespoons flour and replace with 2 Tablespoons cornstarch. For this recipe measure out 3 cups all purpose flour, remove 6 Tablespoons and replace with 6 Tablespoons cornstarch, whisk to blend. 12 strawberries for filling as well as for dipping into chocolate as decoration. Grease and flour three 8 x 2 inch round pans - I recommend using a circle of wax or parchment paper in the bottom of each pan. Cakes with fruit are more likely to stick. In a medium bowl add the flour, baking powder and salt, whisk to blend and set aside. In the bowl of your mixer, add the butter and mix until softened and smooth. Slowly add the sugar and mix on medium speed 4 to 5 minutes. Add the eggs one at a time and mix until the yellow of each egg is blended in. Add the vanilla and strawberry extract, blend. Pour cake batter into prepared pans and bake for 25 to 30 minutes or until a toothpick inserted into the center comes out clean or with just a few crumbs attached. Check at 25 minutes. Next, I spread the layer with a thin coating of ganache, and then piped on a buttercream filling which I spread with my spatula. I then added a layer of thinly sliced strawberries on top of the buttercream. Next, I added my middle cake layer and repeated these steps. 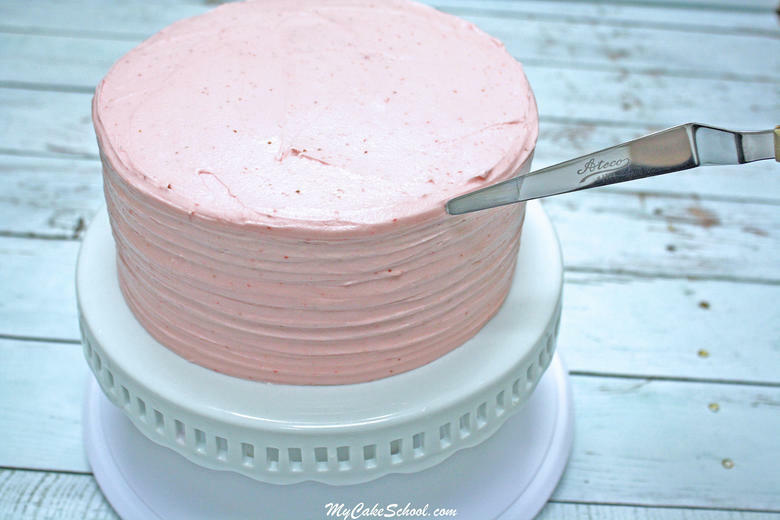 I topped with the top layer of cake and frosted the cake with a coating of strawberry frosting. I filled a disposable piping bag (tip snipped away) with ganache and drizzled around the edge of the cake. I then covered the top of the cake with ganache as well as spread with my spatula. I topped with strawberry buttercream stars spaced around the edge of the cake, (Ateco 863) and then topped each with a chocolate covered strawberry. Thanks for stopping by! 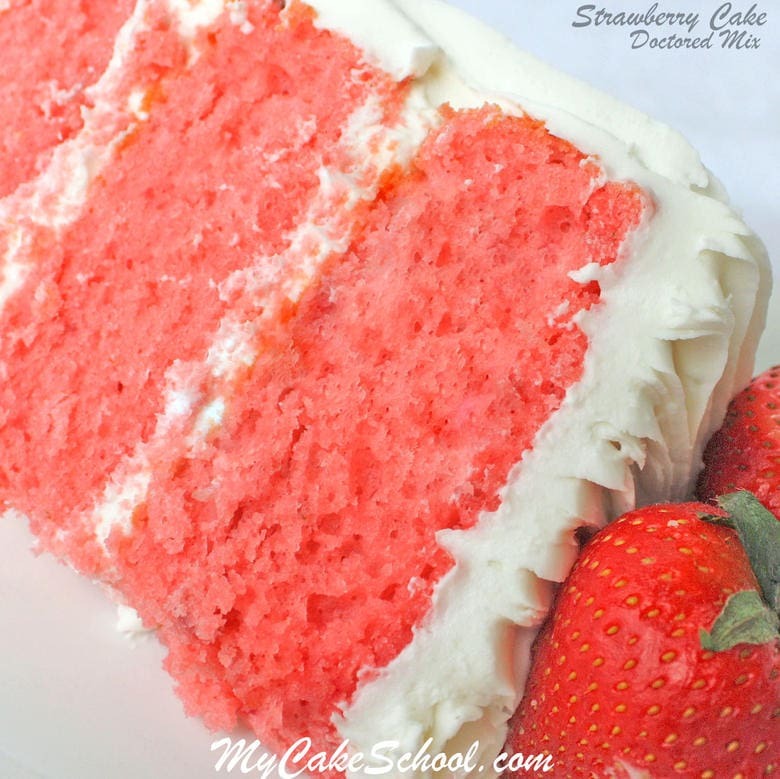 You may also enjoy a few of our other strawberry cake recipes! Here’s our Strawberry Cake Recipe which uses the reverse creaming method of mixing. Same great flavor as this one, but slightly denser. 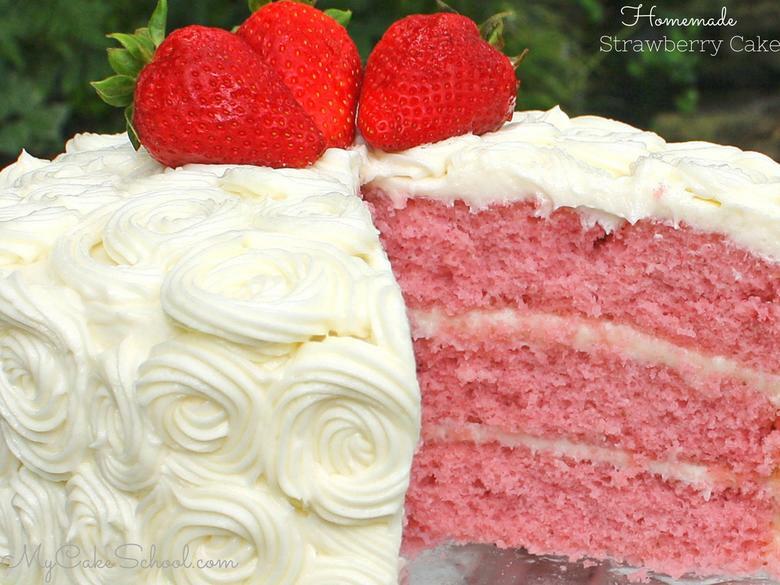 Here’s a fabulous Strawberry Cake Recipe that starts from a simple cake mix! 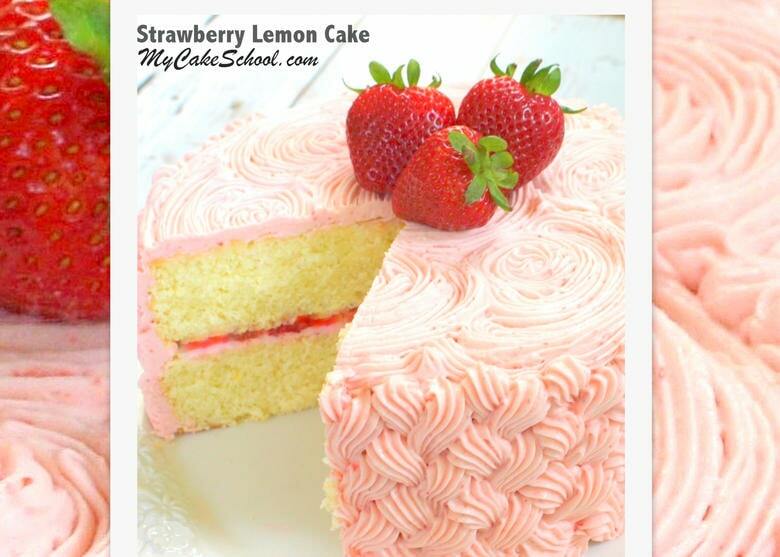 Another fun flavor combination is Strawberry Lemon Cake! This cake features lemon cake layers with strawberry buttercream. For our full collection of favorite cake and frosting recipes, make sure to check out our Recipes Section! Learn Cake Decorating Online with My Cake School! If you would like to learn how to decorate beautiful cakes, we’d love to show you how! Make sure to check out our Free Tutorials section for lots of simple, creative tutorials. We also have a Free Cake Video Section too! If you’d like to have full access to every cake decorating video that we’ve made over the years (hundreds! ), you should consider joining My Cake School! We would love to have you. You can find all of the details here: My Cake School Membership Details- Learn Cake Decorating Online! I am a huge fan of your recipes. Want to try this recipe too. It will be a 2 tier buttercream cake (10″ & 8″). Is this recipe good for tiered cakes? Hi Diana, I sometimes find strawberry extract difficult to find also. I don’t know of a substitute that will give you the extra flavor of strawberry as the extract does. You may have to order it online I recently used Watkins brand that I found at a Walmart grocery. Hi Tisha, Thank you for your nice compliment! Yes, this recipe will be fine for a tiered cake. I had trouble getting the strawberry buttercream to blend appropriately. It stayed separated. Any tips? Hi Amanda, Do you mean you could not get the strawberry puree to blend in or the powdered sugar would not blend in? Let me know how it looked. How can I reduce this cake to 2 layers? Should I cut everything by 1/3? Should I cut the eggs to 3? Thank you. Also, how many days ahead can I make this cake? I’m concerned about the fresh strawberries making it soggy. This will be a birthday cake, and I have plenty of things to do before the event. So I would like a make ahead cake.